Well it’s been a while since I’ve had the time to sit down and write a post for the blog so I thought I’d take the time today to reflect on some of the things I start to think about towards the end of each project. Once I’ve developed the concept for the reconstruction I’m working on, modelled and textured it, I become consumed for a week or two with ‘the finishing touches’. These ‘finishing touches’ can range from tweaking the lighting in the scene, to re-arranging objects and artefacts in a more scattered or jumbled way, making the scene look more lived in and realistic. 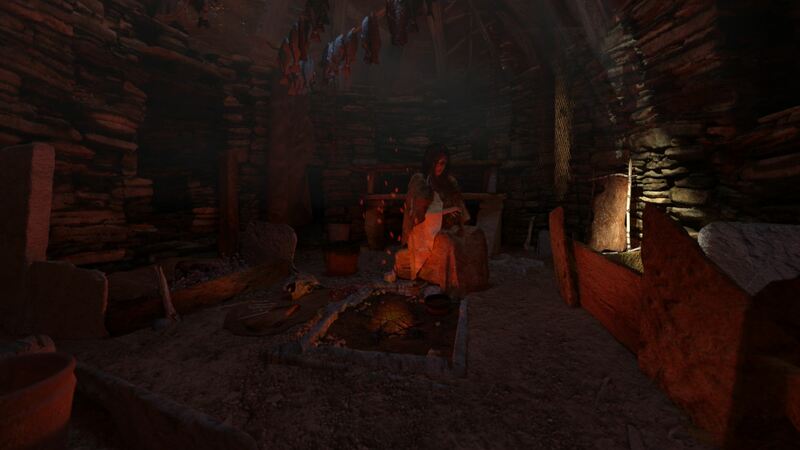 No joke, I spent about 3 days tweaking animated fire sparks in the House 7 reconstruction at Skara Brae to make them look more natural and it still doesn’t quite look right! Photorealism is something I think most artists will strive to achieve at some point in their creative lives, and for me it’s always been something I aim towards in my work. As I learn the software and get to grips with various techniques and methods of working in a 3D environment with each project I’m getting a little closer to the ‘look’ I want to achieve. Sometimes though I have to sit back and consider my priorities. On one hand I’m an artist working in the digital realm and using a lot of software which is also used in the VFX industry for movies and the like, and it’s hard not to aspire to create something beautiful, evocative and photo-realistic when presented with images like the following, made with the same tools I use. On the other hand, the creation of my archaeological visualisations is very much an interpretive research process, which needs to be quantified. So can I justify the extra time it takes to make something look photo-realistic? I think in many ways this level of photo-realism has come to be expected of much 3D work, even in archaeology. The skill and attention to detail is evident in the work, and it’s ability to make the viewer marvel at the fact that they “can’t believe it’s not a photograph!” is regarded as a mark of quality. The delight evoked by such reactions is what fuels our desire to achieve this mastery over the tools we use to create such images. But in archaeology the reaction to photo-realism can be a mixed one and has been the subject of many a heated debate. The most common gripe with photo-realism in archaeological visualisation is the worry that such a hyper-real image gives no indication of uncertainty to the audience in terms of what areas are based on clear evidence from excavation or survey etc, and the areas which have been subject to more creative interpretation. At the end of the day we have to remember that the majority of these images will end up in a museum display or an excavation monograph, often perceived as an informative illustration of fact given their context. On a number of occasions my work has been met with the response of “but…people are going to think that its real, they won’t realise it’s an interpretation”. So it seems that alongside the delight of the visual trickery of photo-realism there is also a fear that hyper-realistic images in some way seduce the audience into dropping their archaeologically informed guard and loosing their ability to critique the information within the image rationally. I’ve always tended to take the view that the problem lies not with the content or style of the visualisation/reconstruction itself, but more with the way archaeology views the ‘place’ of reconstruction within the discipline. Maybe it’s the artist in me talking louder than my archaeological side, but I see the strength of photo-realistic image, detailed with the clutter and chaos of everyday life as being a thought-provoking starting point for interpretive discussion, rather than the definitive conclusion about the way a site was used and occupied in the past. We have excavation reports, papers, museum displays of artefacts with informative captions and the like already, surely the strength of a visualisation is that it adds in what is missing, breathes life into the artefacts and site plans, takes the archaeology from the static to the dynamic? The Skara Brae work I’ve been doing with Kieran and Aaron addresses a lot of these issues through the mixing of media and use of a narrative, so it will be interesting to see how our film is received by different audiences! We’re almost there with the final rendering, and are currently putting a draft sequence together then thinking about how to add sound. The end is in sight! I think photo-realism is something the artist in me will always strive to achieve, though the archaeologist in me will have to have a bit more of a think over whether it’s really necessary for archaeological visualisation and the critical research process as a whole. Interesting. I think part of the discussion needs to be about whether photography is, in and of itself, about “realism”. It’s a well-worn point to make, but Picasso’s “Guernica” can be argued to feel a more “realistic” expression of the visceral horror of the Spanish Civil War than many photographs. And if the “realism” of photographs lies significantly in the medium’s ability to capture a fleeting and ephemeral moment, does that change when the fleeting, ephemeral moment is artfully and skilfully staged? (Or, indeed, reproduced, as in much of the photo-realistic art on Ivan Terzic’s blog; as you quite rightly remind us, photo-realism is not the sole preserve of the 2D or 3D digital arts) I understand completely the attraction of photo-realism, particularly in archaeological reconstructions. After all, photo-realism is primarily about detail, and some of the data which archaeology captures is highly – even microscopically – detailed. But does “data-detail” really equate to “visual detail” or “representational detail”? And do we really understand the past in terms of the hyper-detailed snapshot – the moment frozen in time? Or do we actually understand the past in terms more like a tracking shot, moving spatially and temporally across an archaeological landscape, with objects, events and the relationships between them slipping in and out of focus? If the latter, then perhaps the practice of “photo-realism” needs to be blended much more into a continuum of representational techniques. Hi John, Hope you’re well! I totally agree with you on the Guernica front. When I really sit down and think about what’s important to me in my work it always comes back down to creating a sense of place and a “realistic” depiction of the subject rather than a realistic aesthetic as such. Not that I want the scene to look photo-realistic, but more that I want to capture an essence of the energy of real life, but I suppose most of the time in the medium of 3D artwork especially photo-realism goes hand in hand with this. At the end of the day I think producing an image, be it photo-realistic or stylised, for me is more about the content being convincing enough to evoke a reaction in the viewer, almost an empathy I suppose. 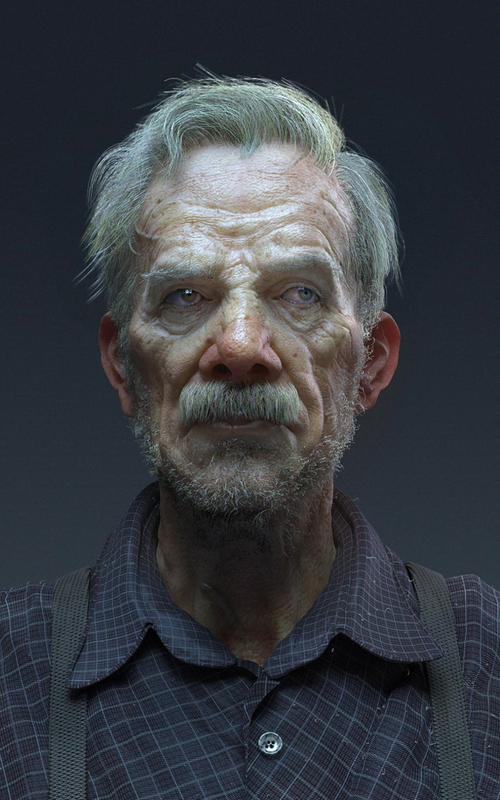 So in that sense photo-realism is a bi-product of that creative process, not a fuel for it. 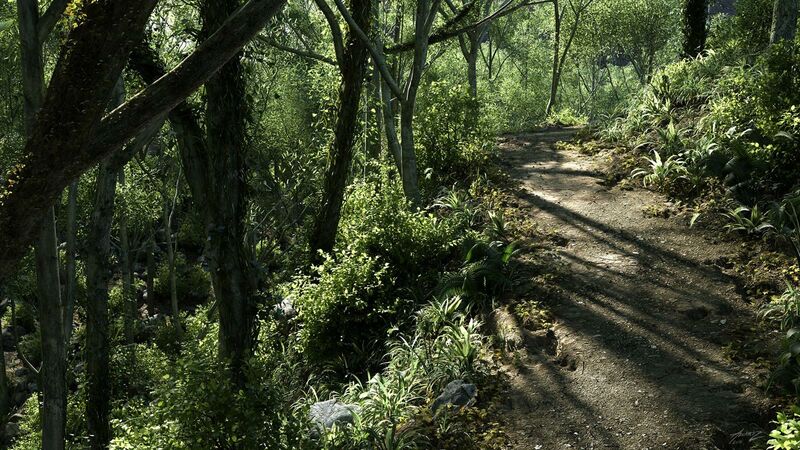 ….but then again, a photo-realistic image does look pretty! Reblogged this on Visualising Neolithic Orkney. I agree with John and would go so far as to say that photo-realism is an overused oxymoron. Photography has only a very tentative connection to reality, as does CGI, drawing and painting. I think that a ‘photographic’ image made with any of these tools is just as likely to miscommunicate the reality it is supposed to ‘capture’ as an abstracted image. Currently CGI is most often used to mimic the photographic aesthetic which we are acclimatised to. This trickery is a potent tool which can be used to loose the viewer in an underlying narrative, successfully demonstrated above, however we shouldn’t confuse this with reality, or think of it as any more ‘true’. Hey Kieran, sorry totally missed your comment sorry for the late reply! I agree, particularly with your last point that we shouldn’t see photorealistic images in archaeology as being any more ‘true’ than an abstracted image or one produced using a different medium like paint or sketching etc. In my experience people often take interpretive cues from the medium used so for example an abstract piece of work or one done in watercolours is seen as the ‘artists impression’ and subjectivity is implied – often with photorealistic images or for that matter ones produced in software like autoCAD which perhaps aren’t photoreal, but are more architectural in style are perceived as being more scientifically correct…when in reality they aren’t! ← New SERF Season Begins!